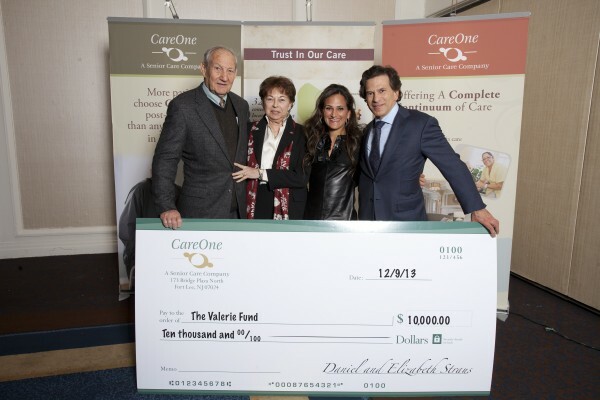 BERGEN COUNTY, N.J.–(BUSINESS WIRE)–CareOne CEO Daniel E. Straus has announced the company’s fundraising campaign to benefit New Jersey’s largest network of healthcare facilities for children with cancer and blood disorders, donated $10,000 to the group and pledged that the CareOne community will donate 500 toys to the centers’ children by Christmas. He said that while some 2014 plans for support of the Valerie Fund are still being formulated, CareOne does plan a major New Jersey fundraiser gala during Valentine Day’s week, and a significant volunteer effort to support the Valerie Fund’s annual Camp Happy Times – an annual free one-week overnight camp experience for children aged 5-21 who have or have had cancer. Nearly 200 children attend each summer. The fundraising gala will be held on Feb. 12, 2014 at the Liberty Science Center in Jersey City, N.J. Plans for the other CareOne fundraising activities will be announced at a later date, Straus said. The Valerie Funds centers are located at top pediatric hospitals within an hour’s drive of most of New Jersey’s population, providing state-of-the-art medical and emotional care in a happy, upbeat, child-centered atmosphere. The hospitals with which the centers are associated and their locations are Morristown Medical Center, Morristown; Saint Barnabas Medical Center, Livingston; Newark Beth Israel Medical Center, Newark; Columbia University Medical Center, New York City; Overlook Medical Center, Summit; Children’s Hospital of Philadelphia, Voorhees; and Children’s Hospital at Monmouth Medical Center, Long Branch. About the Valerie Fund: The Valerie Fund is a not-for-profit organization established in 1976 in memory of nine-year-old Valerie Goldstein by her parents, Ed and Sue. The Valerie Fund’s mission is to provide support for the comprehensive health care of children with cancer and blood disorders. Families turn to The Valerie Fund because of the unique combination of medical care, counseling, and other services it provides. The Valerie Fund Children’s Centers comprise the largest network of healthcare facilities for children with cancer and blood disorders in New Jersey, and one of the largest in the nation. See more at: http://www.thevaleriefund.org/. About CareOne: With a focus on the highest standards, clinical best practices and strong management principles, CareOne has developed a reputation as a premier health care company in New Jersey. With services that include post-hospital care, rehabilitation, assisted living, long-term care and a variety of clinical specialty programs, CareOne offers compassionate care in gracious, professionally managed centers and communities.